Jesus asked some pretty crazy questions like Why are you afraid? to men in a sinking boat and Why are you crying? to a woman at a tomb. Another crazy question came after the resurrection. Remember the story? Two of the disciples of Jesus are walking along, confused and sorrowful, discussing the death and missing body of Jesus. Jesus walked up to them and asked what they are talking about. They were surprised that anyone would not know of the near mob riot and the death of the Great Teacher that had just occurred. 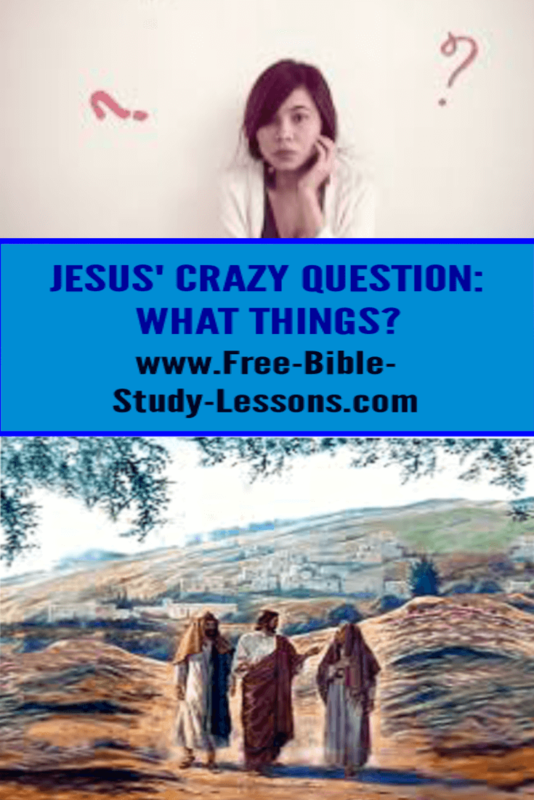 Jesus innocently asks, “What things have happened?” Seriously! He was the only One Who truly know what had happened with all of its ramifications! Obviously, He was not asking out of ignorance or to gain information. Jesus had a deeper purpose. The disciples were hurt and confused. Their hopes had been dashed. Everything was bottled up inside of them. They need to get it out in the open where they could look at it in the light. Every counsellor knows that listening is very important not only to gain insight into the situation, but also to give the counselled the opportunity to bare their hearts…to get things out in the open. Sometimes people aren’t even looking for solutions, but simply need to express what is in their hearts so they can face it. Jesus allowed them to pour it all out…the dashed hopes…the pain…the confusion… But He did not stop there. He did not allow them to wallow in self-pity or introspection. After they had expressed their thoughts and feelings, Jesus forced them to face reality. Jesus listened, but He did not offer them false sympathy to soothe their wounded souls. Jesus wasn’t being insulting [and you can see from their reaction that they did not take it that way], but He was saying that if they had really known the Scriptures and believed God they would have known all this was going to happen. Neither did He leave them there. He went on patiently explaining what the Old Testament had said about what happened. And His disciples, seeing the Truth, got excited. Fear, confusion and doubt can cloud our minds. Sometimes we try to hold it in for fear of what people will think or because it sounds so bad or we don’t want to be rejected. You can always share it with Jesus. He won’t be offended unless we are just looking for a pity party. Many times it is also helpful to have one or two trusted friends or a counsellor that we can share openly with. Once we get it out in the open, we can examine it. Exposing these dark areas of our life to the light can bring perspective and encouragement. A fear faced is on its way to defeat. Notice how Jesus ministered to their needs. Jesus opened the Scriptures to them. He took them to the Word of God so they could see the Truth. As children of God we need to go to the Scripture to find the Truth. Yes, we need to get our thoughts and feelings out so we can examine them, but we need to examine them in the light of Scripture. If we don’t look for the Truth of God’s Word in our situation then we can end up just going in circles on a dark path. Jesus forces us to face [not deny] the confusion and struggles within, but He never leaves us there. We face it so we can conquer it and move on to victory. If we find ourselves just going around and around in circles it is time to stop the wheel and examine the Scriptures. We must learn the Truth about Who God is, who we are in Him and the actions or steps we need to take to move forward. Sometimes we can do this just between Jesus and ourselves and sometimes we need the help and encouragement of trusted friends or a professional counsellor. In any case, when Jesus comes to you and asks, “What things?” don’t clam up and pretend everything is fine. Get it out and let Him wrap His arms around you as you and He move forward. And if you have never met Jesus as your Lord and Saviour, you need to come to Him. He is loving and He cares for you. You are safe with Him. Pour out your heart to Him, repent of your sins and ask Him to be your Lord and Saviour. He will never reject you, but He will come to you and together you can move forward. Together forever, Forever together.